The hardcover edition followed the paperback, which was published by Bantam Books: A McLuhanesque turn of the screw. Quentin Fiore designed and, with Marshall McLuhan, co-authored The Medium Is the Massage, an icon of the 1960s and required reading for everyone involved in what McLuhan dubbed the “electric age.” McLuhan was a philosopher and seer whose books—The Mechanical Bride, The Gutenberg Galaxy, The Making of Typographic Man, and Understanding Media: The Extensions of Man,—explored the evolution of technology and its effects on conscious and subconscious behavior. Revered by some, McLuhan was called a fake, a charlatan, and worse by critics who argued that his ideas were either simplistic, obtuse, silly, or contradictory. McLuhan argued that contradiction was an essential part of the contemporary condition and, moreover, that contradiction was a metaphor for television, a medium which allowed a person to ponder two or more ideas at one time. 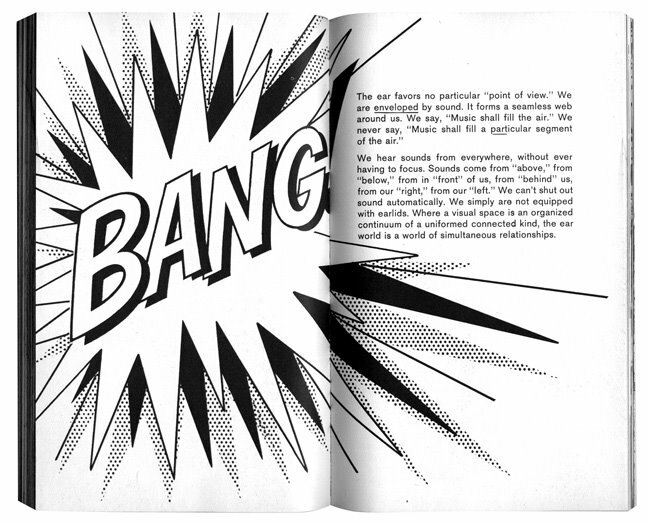 To briefly state his theory, and thereby lay a foundation for Fiore’s graphic design, McLuhan believed that the invention of print and printing shattered community by allowing the oral tradition to become obsolete. He argued that writing and reading were solitary acts that adversely effected tribal unity, memory, and imagination. Electronic media, and television specifically, was destined to return us to a Global Village, allowing individuals to once again take an active role in the communications process. His mantra was “the medium is the message.” Media, he argued, are extensions of human activity (just as the wheel is an extension of the foot). Television, he said, allowed for greater individual participation. McLuhan, who believed that humor was paramount to conveying his message and was a passionate punster, said that electronics made “all the world a sage.” Marvin Kitman, who acerbically reviewed The Medium Is the Massage (the title is a double entendre on “mass age” and McLuhan’s notion that media are so pervasive that they work us over like a masseuse) referred to it as The Tedium Is the Message. At least at first, the criticisms of the book’s contents and visual presentation overwhelmed the praise. But this should not eclipse the historic nature of Fiore’s work. The Medium Is the Massage was called the first book for the television age. The New York Times critic Eliot Freemont Smith said that the large format of the hardcover takes on “the aspect of a T.V. screen.” Fiore designed it as a kinetically flowing collection of word bites, iconic images, and clear and crisp typography. He underscored and highlighted McLuhan’s ideas with what amounts to a series of literary billboards, or what McLuhan impishly described as “collide-oscopic interfaced situations.” Read the full essay at http://tinyurl.com/lyzg756 . Adapted from an essay in Design Literacy: Understanding Graphic Design (Allworth Press, 1997). Steven Heller is the co-chair of the SVA MFA Designer /Designer as Author + Entrepreneur program, writes a weekly column for The Atlantic online and is the “Visuals” Columnist for the New York Times Book Review. He is also the author of over 160 books on design and visual culture. And he is the 2011 recipient of the Smithsonian National Design Award.